Francis Grant Rumbles was born on 14 September 1920 in Kirtlebridge, Dumfriesshire. His father was the headmaster of Breconbeds School in the village, and the young Grant was educated there. He joined the RAF in October 1940, and inevitably acquired the nickname ‘Jock’. He was originally selected for pilot training, but ended up qualifying as a navigator. Part of his training was spent in Port Elizabeth in South Africa, and he was commissioned in April 1942. Rumbles crewed up with Les Munro at 29 Operational Training Unit in July 1942, along with Bill Howarth, and the crew undertook two operations in September 1942 while still under training. They went on to heavy bomber training and arrived at 97 Squadron at Woodhall Spa in December 1942. At this time, Rumbles and Munro were the only two officers in the crew, so they were given a room in the comparative luxury of the Petwood Hotel, in its wartime role as the station’s Officers Mess. 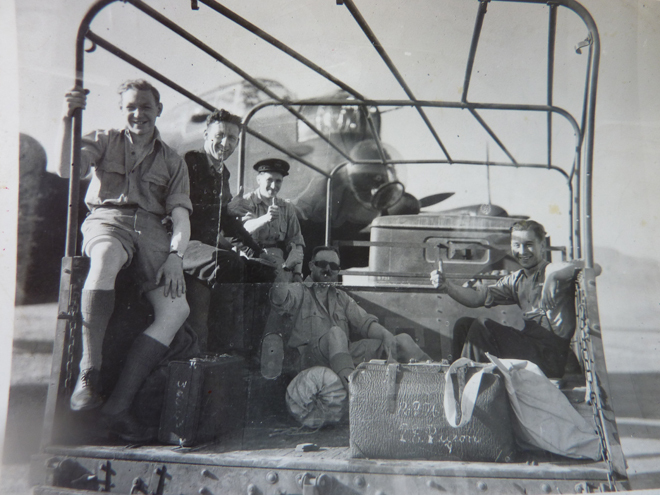 Munro and his crew completed another 20 or so operations in the first three months of 1943, and then volunteered for transfer to the new 617 Squadron at RAF Scampton. In June 1943, soon after the Dams Raid, Rumbles was awarded the DFC for his 23 operations completed while in 97 Squadron. He went on to complete 33 more, and was awarded a Bar to the DFC in June 1944. When the Munro crew were all taken off operations in July 1944, Rumbles was posted to RAF Waddington and later onto a specialist navigation course. Towards the end of the war he became Squadron Navigation Officer for 189 Squadron and then Station Navigation Officer at RAF Bardney. He stayed on in the RAF for a short while after the war, serving in Singapore and Japan, before retiring in 1947 as a Squadron Leader. He then moved to South Africa. Grant Rumbles died in Port Elizabeth, South Africa, on 26 February 1988 and was cremated there. He is commemorated in the city’s Victoria Park Crematorium. Facebook page about Breconbeds School, with obituary of his father. Survived war. Died 26 February 1988.